[Miga_v10] "Entropic" is fundamentally a game in which order and chaos follow upon each other without any solution of continuity. The vjing (Pintaycolorea) is no longer viewed as a passive visual support for a certain type of club-music, but rather, it creates an interaction with the musician (Økapi) in a dialog between peers. A new idea in instant compositions, in which the audiovisual images blend together or clash in real time. [Miga_v10] Pintaycolorea + Økapi "Entropic" from Miga on Vimeo. You can share it with VIMEO or YOUTUBE. Versatile and creative artist, after finishing her degree in fine arts in Salamanca, she moves to Amsterdam in 2001 where she starts as a vj at the Superclub. 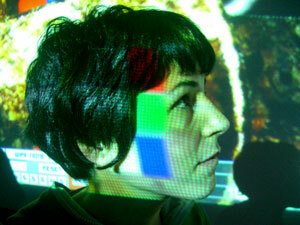 Comes to Rome in 2003 to go on with her studies in Web design & Strategy and becomes part of the Flxer team, vj and video artists collective, collaborating in video live performances proyects. Her work reflects her formation and personality as a multimedia artist, able to express herself with diferent languages such as graphics, silkscreen, paintings and video that mixes together in a colourfull performance. 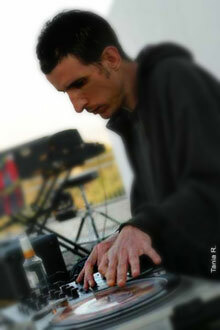 Actually vj resident seasson (2007-08) at Goa club and Brancaleone, Roma. Økapi starts playing vinyls and turntables, influenced by the new plagiarizing artists and radical djs on the musical scene, always maintaining the clasical focus on concrete and electroacoustic music. Also composed music for theatre acts (Festival di teatro Di Gubbio, Festival di Ostia Antica) and played often with the JazzCore Zu band, the audiovisual collective Cane Capovolto and with the french trio Metamkine. In 2000 creates the trio Dogon (with Massimo Zu and Martux_M) and always together with Martusciello participates in the Biennalle at Venezia, in Controindicazioni, RingRing b92 Around the World, on the Biennale artisti d'Europa e del Mediterraneo o Musica 90 (Torino). On 2000 plays with the radical american dj Christian Marclay for a live performance broadcasted by the RAI. With Metaxu plays at the "OFF-ICMC" festival in Berlin. In 2005 publishes his first CD as soloist "Where´s the Beef?" which had good feedback worldwide. Collaborated together with ZU with the american hip hop group Dalek. In 2006 publishes for EMI a Caparezza´s remix called “La mia parte intollerante”.